Will Scandal Finally Engulf Olmert? In many countries you expect police investigators to tiptoe around a prime minister. But not in Israel, not any longer. It is a measure of how far Prime Minister Ehud Olmert has free-fallen in the public esteem that police investigators are now openly saying that if he were an ordinary citizen  and not the highest elected figure in the land  he would already be under arrest. On Friday, Olmert was interrogated for the third time in a widening probe on alleged corruption and fraud that could eventually lead to the flame-out of his political career. A revolt has already begun in Olmert's Kadima party, which has decided to hold primaries by mid-September, a move designed to oust him. Polls show that if Olmert, tarred by scandal, were to keep clinging to the leadership of Kadima, the party would collapse  and it would drag the coalition government along with it. 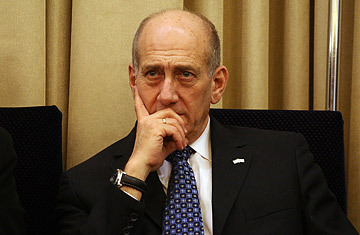 Zevulon Orlev, chairman of the National Religious party, called for Olmert to quit after police interrogated him on Friday, saying: "In an enlightened country, he would have resigned a long time ago." Olmert could go sooner, if the corruption and fraud allegations stick. The prime minister says that he is the innocent victim of "a police campaign" against him. But after a combative, two-hour grilling at his official Jerusalem residence on Friday, police investigators issued a statement claiming that Olmert was suspected of "serious fraud and other offenses." He was questioned about the allegedly double billing of charity organizations for his trips abroad as mayor of Jerusalem and trade and industries minister. Yad Vashem, the Holocaust museum, as well as charities helping physically and mentally handicapped children were among those that Olmert allegedly double-charged. Police investigators accuse Olmert of putting the surplus money into a private bank account, amassing upwards of $100,000 over the years, and dipping into it for his family vacations. The Prime Minister's Office denies the charges and says that Olmert paid for his private trips with frequent flier miles. His office blames the police for "a misleading attempt to create drama." But Olmert faces other suspicions, too. On Feb.17th, his lawyers will cross-examine an American multi-millionaire, Morris Talansky, who earlier told police that over the years he had given Olmert hundreds of thousands of dollars in envelopes stuffed with cash for campaign funds which were used for expensive items and vacations. Talansky also claims he gave Olmert loans which were never re-paid. Olmert denies the allegations but says that if he is indicted, he will resign. For many Israelis, sick of the scandal that has engulfed the prime minister for many months, that can't happen soon enough. Olmert, they say, has been too wrapped up in his own defense that he cannot run the country, or make peace with the Palestinians.